"London Met" redirects here. For police, see Metropolitan Police Service. London Metropolitan University, commonly known as London Met, is a public research university in London, England. The University of North London (formerly the Polytechnic of North London) and London Guildhall University (formerly the City of London Polytechnic) merged in 2002 to create the university. With roots going back to 1848, it is one of London's oldest educational institutions. The university has campuses in the City of London and in the London Borough of Islington, a museum, archives and libraries. Special collections include the TUC Library, the Irish Studies Collection and the Frederick Parker Collection. London Metropolitan University was formed on 1 August 2002 by the merger of London Guildhall University and the University of North London. 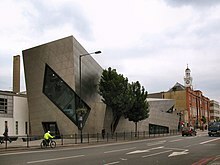 In October 2006 the University opened a new Science Centre as part of a £30m investment in its science department at the North campus on Holloway Road, with a "Super Lab" claimed to be one of Europe's most advanced science teaching facilities, and 280 workstations equipped with digital audio visual interactive equipment. In 1848 Charles James Blomfield, the Bishop of London, called upon the clergy to establish evening classes to improve the moral, intellectual and spiritual condition of young men in London. In response, the bishop Charles Mackenzie, who instituted the Metropolitan Evening Classes for Young Men in Crosby Hall, Bishopsgate, London, with student fees at one shilling per session. Subjects on the original curriculum included Greek, Latin, Hebrew, English, History, Mathematics, Drawing and Natural Philosophy. This fledgling college came under royal patronage following the visit of Prince Albert to the classes in 1851. 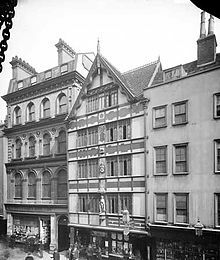 In 1860 the classes moved to Sussex Hall, the former Livery Hall of the Bricklayers' Company, in Leadenhall Street. By this time, some 800 students were enrolled annually. In 1861 the classes were reconstituted and named the City of London College. Over the next twenty years, the College was one of the pioneers in the introduction of commercial and technical subjects. The college built new premises in White Street at a cost of £16,000 (contributions were received from Queen Victoria and the Prince of Wales) and were opened in 1881. In 1891 the college joined Birkbeck Institute and the Northampton Institute to form the City Polytechnic by a Charity Commissioners' scheme to facilitate funding for these institutions by the City Parochial Foundation, and to enable the three institutions to work cooperatively. However this attempted federation did not function in practice, as each institution continued to operate more or less independently. The City Polytechnic concept was dissolved in 1906 and the City of London College came under the supervision of London County Council. Electra House, 84 Moorgate, built by John Belcher in 1902, topped by a sculpture of young Atlases supporting a zodiacal globe by F.W. Pomeroy. In December 1940 the college's building was destroyed by a German air raid. City of London College subsequently moved into premises at 84 Moorgate in 1944. In 1948, the City of London College celebrated its centenary with a service of thanksgiving addressed by the Archbishop of Canterbury at St Paul's Cathedral. In 1970 the college merged with Sir John Cass College to form the City of London Polytechnic. In 1977 it also became the home of the Fawcett Society library, afterwards the Women's Library. Under the Further and Higher Education Act 1992 the Polytechnic was awarded university status (having previously awarded degrees of the Council for National Academic Awards). It was renamed London Guildhall University, to demonstrate its links with the City of London and the City's many guilds/livery companies. It was unassociated with the Guildhall School of Music and Drama, based at the Barbican Centre. It was ranked 30th out of the UK's 43 new universities in the 2001 Research Assessment Exercise. In August 2004, in the midst of a contract dispute with former LGU staff following the merger with the University of North London, it was reported that the management of the merged institution had ordered the destruction of the entire print run of a history of the university – London Guildhall University: From Polytechnic to University – authored by Sean Glynn, formerly a senior research fellow in the department of Politics and Modern History; the work had been commissioned by Sir Roderick Floud, the President of London Metropolitan University, when Provost of LGU. Founded as the Northern Polytechnic Institute in 1896, it merged in 1971 with the North Western Polytechnic which was established in 1929, to become the Polytechnic of North London. Until the passing of the Education Reform Act 1988, the Polytechnic was under the control of the Inner London Education Authority – part of the then Greater London Council and awarded the degrees of the former Council for National Academic Awards. Under the Further and Higher Education Act 1992, the institution, a pioneer of widening participation and access to higher education, was granted university status and the right to award its own degrees. Following the merger with London Guildhall University, London Metropolitan University became the largest unitary university in Greater London. The former UNL campus is now the North campus and is located on Holloway Road, near Holloway Road and Highbury & Islington tube stations. In May 2008, London Metropolitan University presented the 14th Dalai Lama with an Honorary Doctorate of Philosophy, for "promoting peace globally". This move caused controversy among the Chinese public and the overseas Chinese community, who view the Dalai Lama as partly responsible for the 2008 unrest in Tibet. As a result, Chinese migration agents had been reported to "boycott" London Metropolitan University in advising clients who wish to study in the UK. The university's Vice-Chancellor, Brian Roper, issued an apology letter to the Chinese Foreign Ministry via embassy officials in July. In an interview with the Global Times, a worker at a Chinese study abroad agency suggested that the university could repair the offence of the honours by refusing speaking platforms to Tibetan independence groups, such as the university's own "Free Tibet Society". The university has also faced criticism for offering free scholarships specifically reserved for students from the Tibetan exile community in India, Nepal and the West, in a case of non-merit "racial quotas". In July 2008 it was reported that a financial crisis was looming for the university. London Met had been misreporting data on student drop-outs for several years and, consequently, the Higher Education Funding Council for England (HEFCE) was proposing to claw back at least £15 million for the overpayment in 2008-9. In February 2009 the figure of overpayment was revised to £56 million by HEFCE, who were seeking to recover the money. On 19 March 2009, in response to the crisis, vice-chancellor Brian Roper resigned his position with immediate effect but continued to receive his salary until December 2009. In May 2009 Alfred Morris, former vice-chancellor of the University of the West of England and University of Wales, Lampeter, was appointed interim vice-chancellor. The government announced in May 2009 that there would be an independent inquiry, exploring the possibility that HEFCE had colluded with London Met by failing to query implausibly low drop-out rates. It concluded in November 2009 and was reported to cast responsibility to Brian Roper, other senior administrators and the Board of Governors. Following conclusion of the report, the chair of HEFCE called on "senior staff" and the entire Board of Governors to resign, noting that HEFCE was not convinced that the university's management could effectively safeguard public funds. After the deadline indicated by HEFCE chief executive Alan Langlands had passed, there were ruminations among staff and ministers that HEFCE could withdraw funding, effectively forcing the university to close. A report commissioned by the university, published in November 2009, found that Roper had "the major responsibility and culpability" for the financial situation: Roper and some members of the executive were aware that the university had been applying its own interpretation of funding rules on student drop-outs – rather than the funding council’s – since 2003, but took no action. The university’s board of governors and audit committee had an oversight role, which made them ultimately "accountable for a financial failure of this magnitude" and meant that they "must take overall responsibility". In early 2011, London Metropolitan University announced an overhaul of undergraduate education for students entering courses in 2012. This included a reduction in the number of courses from 557 to 160. The announcement also signalled a move from semester-long to year-long modules, and thirty weeks of teaching, a gain of six weeks on the current average. The university argues that the longer learning time will help increase the opportunity for development and guidance before students move to final examinations. There will be a transition to this new course offering in 2011/12 and this has led to applicants for some courses being contacted and offered alternative programmes. In April 2012 the university was reported to be considering creating alcohol-free zones and events to enable Muslim students (who form 20% of the student population) to take part more comfortably. This provoked criticism from the university's Islamic societies, and other organisations such as the Muslim Council of Britain, but positive comments from representatives of the National Union of Students and the Federation of Student Islamic Societies. On 16 July 2012 the UK Border Agency of the Home Office suspended the university's "highly-trusted status" with the Border Agency, a status required in order for the university to be eligible to sponsor both new student visa applications as well as existing student visas, for foreign students from outside of the European Union and the European Economic Area (or Switzerland). The university was one of three institutions to have such a status suspended. On 30 August 2012, the university's highly trusted status was revoked, revoking the university's right to sponsor new visa applications for non-EU/EEA foreign students, as well as revoking the existing visas of the university's pre-existing non-European foreign students, causing them to be excluded from the university, and leaving thousands with the possibility of being forced to leave the country, unless places with alternative institutions and sponsors are secured. The Immigration Minister, Damian Green, cited a number of reasons for the decision, including the discovery that more than a quarter of the students in the test sample did not in fact have leave to remain in the UK, that the university did not have and could not provide sufficient proof of English-language proficiency standards for some of its students, and the fact that the university was unable to confirm the attendance of its students, in some 57% of the sampled cases. In September the university announced it was beginning legal action against the border agency over the licence issue. In April 2013 the university regained its licence to sponsor international students for Tier 4 visas. The High Court case against Home Office was settled in October 2013 after both parties reached an undisclosed settlement. Both parties have refused to comment on the specifics of the settlement. The last minute withdrawal of the case meant that the judicial review against the Home Office, which had been scheduled to start on 17 October 2013, would not proceed any further. The main university campus is on Holloway Road in the London Borough of Islington. There are smaller campuses at Aldgate and Moorgate in the City of London. Aldgate houses the Sir John Cass School of Art, Architecture and Design and Moorgate is home to the Guildhall School of Business and Law. London Metropolitan offers about 160 degree courses, to 12,145 students (including 7,000 overseas students from 155 countries). The university also maintains several offices abroad in Beijing, Chennai, Delhi, Dhaka, Lagos and Lahore. The university's operations are overseen by a board of governors comprising external members and senior administrative and academic staff. The former Sir John Cass College site at 31 Jewry Street. The Sir John Cass Foundation offices are on the premises which are leased to the university by the Foundation. The university invests over £700,000 annually in its scholarship programme to help academically excellent students as well as students with outstanding achievements in various sports disciplines, such as hockey, tennis and basketball. The university gives £1000 for any of its undergraduate international students who achieve 'A' grade marks. The university also offers postgraduate scholarships, a range of full tuition scholarships, including some scholarships with free accommodation. Scholarships are offered in conjunction the BBC World Service, International Student House and Mahatma Gandhi Foundation. The university has several student exchange programmes with academic institutions in the US and Europe, with financial support for those who participate through the Erasmus programme. In the past, the university refused to participate in newspaper league tables on the grounds that Universities should be assessed by the UK Government and not (private) newspapers. The new management reversed this policy and in the 2013 rankings (published in 2012), the university was placed 118th out of 120 universities in the Guardian University Guide 2013. In the 2011 Institutional Audit, the Quality Assurance Agency expressed "reasonable confidence" in the "academic standards" of the university's awards. In the 2008 Research Assessment Exercise, London Metropolitan was ranked equal 107th out of 132 institutions by the Times Higher Education's RAE league table. The university has not fared well in the most recent national league tables (2014/2015) and has placed last in each respective league table, Guardian University Guide 2015 (116th), Complete University Guide 2015 (123rd) and The Times and Sunday Times University League Table 2014 (121st). The architecture department was ranked 18th and 20th in 2011 and 2012 in the Guardian University League Tables. American Studies placed 20th, 17th and 18th in 2011, 2012 and more recently, at the newly published Complete University Guide 2013. The law school ranked 87th in 2011 at the Complete University Guide and rose to 85th in 2012, 75th in 2013 and most recently placed 70th out of 98 law schools at the 2014 Complete University Guide. It is also ranked 58th out of 96 in Research Assessment. The university also entered the QS World University Rankings of top universities in the world for the first time placing at 651–700 bracket. London Metropolitan University Students’ Union (MetSU) is the students' union for students at London Metropolitan University. It provides representation, advice and support to students at the university. MetSU is run by five full-time sabbatical officers and five part-time officers. MetSU has two offices, in City at CM2-22 Calcutta House, Old Castle Street and North Campus office is in Tower Building Room No TMG-74-75, 166-220 Holloway Road. Verve Magazine – launched in 2009 by journalism students; articles about the university, general politics, entertainment, lifestyle, fashion and sports. Verve Radio – launched in 2011 as a platform for student thoughts and opinions; regular shows hosted by student DJs. Dictum – launched in 2010 by law students; articles on law, politics and international relations; notable guest writers include Supreme Court Judge Robert Walker and writer, blogger and barrister Tim Kevan. The 1997 Mike Leigh film Career Girls is about a reunion between two women who shared a flat six years earlier whilst studying at the Polytechnic of North London. James Hyman, DJ, Radio & TV presenter, music supervisor and MD of JLH. Adaora Onyechere, a Nigerian TV/radio presenter, entrepreneur, motivational speaker and author. Rowan Carstairs, 1973-1977 (Philosophy: North London Polytechnic) Entrepreneur, Writer, and Social Housing Advocate. Ian M. Cook, Chairman, President and chief executive officer of Colgate-Palmolive. Jane Shepherdson, chief executive of UK clothing brand, Whistles and was brand director for TopShop. ^ "Annual Report and Accounts 2012-2013" (PDF). London Metropolitan University. p. 32. Retrieved 30 October 2016. ^ "160 years of London Met". London Metropolitan University. Archived from the original on 13 September 2012. Retrieved 27 August 2012. ^ a b Chris Green. "A-Z Unis & Colleges: London Metropolitan University". The Independent. Archived from the original on 13 October 2007. ^ "TUC | History Online". Unionhistory.info. Retrieved 21 October 2011. ^ "Science centre 'best in Europe'". BBC World Service. 8 November 2006. Retrieved 27 August 2012. ^ "Brought to you in association with London Metropolitan University". Guardian Unlimited. 2007. Retrieved 27 August 2012. ^ "Science 'superlab' opens at London Met United Kingdom". International Education Media. Archived from the original on 9 October 2011. Retrieved 27 August 2012. ^ "Book pulped at London Met", Times Higher Education Supplement, 27 August 2004, http://www.timeshighereducation.co.uk/news/book-pulped-at-london-met/190892.article. Retrieved 24 October 2014. ^ "Overseas Chinese communities condemn sabotage activities in Tibet". Window of China. Beijing. Xinhua News Agency. 2 March 2008. Archived from the original on 28 September 2008. Retrieved 6 September 2010. ^ "Dalai Lama urges end to violence". BBC News. 18 March 2008. Retrieved 6 September 2010. ^ Curtis, Polly (9 July 2008). "University says sorry to China for Tibet degree". London: The Guardian. Retrieved 6 September 2010. ^ Xiang, Li (8 July 2008). "London school regrets honoring Dalai Lama". China Daily. Retrieved 6 September 2010. ^ "London school regrets honoring Dalai Lama". www.chinadaily.com.cn. ^ Attwood, Rebecca (10 July 2008). "Hefce clawback means cuts loom". Times Higher Education. Retrieved 21 October 2011. ^ Paton, Maureen (3 February 2009). "Balancing the books". The Guardian. London. Retrieved 11 May 2010. ^ Curtis, Polly (19 March 2009). "Vice-chancellor of London Metropolitan quits". The Guardian. London. Retrieved 11 May 2010. ^ Melanie Newman (21 May 2009). "Governors have explored the legal scenarios if London Met goes bust". Times Higher Education. Retrieved 21 May 2009. ^ Attwood, Rebecca (20 November 2009). "Roper is to blame for fiasco, but London Met's board bears responsibility". Times Higher Education. ^ Jessica Shepherd (12 April 2012). "University where 20% of students are Muslim considers alcohol-free zones". London: The Guardian. ^ Matthew Holehouse (12 April 2012). "London Metropolitan University mulls alcohol ban for 'conservative Muslim students'". Daily Telegraph. ^ Hannah Furness (30 April 2012). "Muslim students condemn 'divisive and irresponsible' university alcohol ban". London: Daily Telegraph. ^ "London Metropolitan University's alcohol-free zone plan". BBC News. 13 April 2012. ^ Barrett, David (22 July 2012). "Ban on university overseas recruits after 'missing' students failure". London: The Telegraph. Retrieved 28 August 2012. ^ "Home Office 'to strip' London Met of highly trusted status". Times Higher Education. 26 August 2012. Retrieved 28 August 2012. ^ "London Metropolitan University's licence to sponsor students is withdrawn". UK Border Agency. 30 August 2012. Retrieved 31 August 2012. ^ "Revocation of Highly Trusted Status for sponsoring international students". London Metropolitan University. 29 August 2012. Archived from the original on 1 September 2012. Retrieved 30 August 2012. ^ "London Metropolitan University's visa licence is revoked". BBC News. 30 August 2012. Retrieved 30 August 2012. ^ "London Metropolitan University students fear deportation". BBC News. 30 August 2012. Retrieved 30 August 2012. ^ "London Metropolitan University starts visa legal action". BBC News. 3 September 2012. ^ "London Met stops legal action against the government". Times Higher Education. Retrieved 16 July 2015. ^ "New directions at London Met". London Metropolitan University. 15 April 2011. Archived from the original on 4 January 2012. Retrieved 27 August 2012. ^ "International students". London Metropolitan University. Archived from the original on 20 August 2012. Retrieved 27 August 2012. ^ "University guide 2013: University league table". London: The Guardian. 21 May 2012. Retrieved 30 August 2012. ^ "London Metropolitan University". Institution Reports. Quality Assurance Agency. 15 April 2011. Archived from the original on 31 July 2011. Retrieved 30 August 2011. ^ "Times Higher Education RAE league table" (PDF). Retrieved 21 October 2011. ^ "RAE 2008 quality profiles: London Metropolitan University". Research Assessment Exercise. Higher Education Funding Council for England. Retrieved 30 August 2012. ^ "University league table 2015 – the complete list". the Guardian. ^ "Top UK University League Tables and Rankings 2015". thecompleteuniversityguide.co.uk. ^ "Login". Retrieved 16 July 2015. ^ "University league table". The Guardian. London. 17 May 2011. ^ "American Studies – Top UK University Subject Tables and Rankings 2015". thecompleteuniversityguide.co.uk. ^ "Law – Top UK University Subject Tables and Rankings 2015". thecompleteuniversityguide.co.uk. ^ Richard Adams. "World university rankings: Harvard pushes Cambridge into third place". the Guardian. ^ "Verve". Retrieved 9 June 2012. ^ "About our radio". Retrieved 9 June 2012. ^ "Dictum Magazine". Archived from the original on 29 July 2012. Retrieved 9 June 2012. ^ a b Website Developer. "Tylers and Bricklayers – Tylers and Bricklayers". tylersandbricklayers.co.uk. ^ "1 James Walter Robert Linton Wholesale China Oil Painting & Frame". chinaoilpainting.com. ^ "London Met graduate fronts Brit-nominated band". Archived from the original on 8 September 2010. ^ London Metropolitan University. "News". London Metropolitan University. Archived from the original on 28 July 2012. ^ "William Bingley". The Daily Telegraph. London. 14 August 2011. ^ "BBC News – UK Politics – Spin doctor to resign". Retrieved 16 July 2015. ^ "The Metropolitan" (PDF). London Metropolitan University. Spring 2007. Retrieved 27 August 2012. ^ "Amos, D. Bernard, Papers, 1963–1991". Medical Center Archives, Duke University. Retrieved 26 August 2012. ^ "Phase Transformations and Complex Properties Research Group". University of Cambridge. Retrieved 26 August 2012. ^ "Bowra, Edward Charles Mackintosh and Cecil Arthur Verner". AIM25,Archives in London and the M25 area. Retrieved 26 August 2012. ^ "Garth Crooks Biography". Biography.jrank.org. Retrieved 21 October 2011. Wikimedia Commons has media related to London Metropolitan University.